Each year Pony Club offers international exchanges in many disciplines. Most recently there was a Tetrathlon Exchange held in Ireland. Team member Jessica Pieracci (H-B, Golden Hills Pony Club in the Middle California Region) shared her experience in a great recap of the trip! 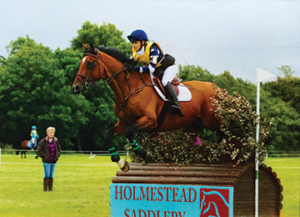 For more information on ALL of the International Exchanges Pony Club offers click HERE. After a week of fun activities such as touring Dublin, Taytos Theme Park, and zip lining, we were ready to start the last leg of our journey—the final competition. Saturday morning we awoke and joined the other countries on the bus with many competitors feeling under the weather and some even feverish. We made it to the shooting range and shot well under the conditions. One wild bus ride and a small lunch later, we were ready to swim! The swimming was held at the beautiful National Aquatic Centre, where the Americans put on excellent performances in the pool. Without exception, everyone swam the same or better than the previous week. After the heats were over, a friendly swim relay race was held between each country, which ended in many laughs and jokes. To finish up the long day, we headed to Tattersalls horse park to course walk. The cross country course was very challenging. There were 21 numbered fences with over 30 jumping efforts and numerous technical combinations seen at the FEI 2 star level. Our coach lead us on a step-by-step course walk and helped each of us decide the best plan for our horses. After our walk, we all came home tired, but happy about the day’s performances, and very excited about the next day. On Sunday, we awoke full of energy and nerves. By 8:00 we were at Tattersalls walking our course a final time. After that, we separated to find our horses and began getting ready. At 9:00 the rides started. Everyone rose to the occasion on their switch rides in admirable fashion and demonstrated excellent decision making when posed with each question that their round asked of them. That evening, the Irish hosted a barbeque at Tattersalls with a traditional pig on a spit. We returned home late, but eager for the run the next morning. The next day, we were up and ready to return to Tattersalls one last time for the run phase. The bright red jerseys of the American teams went blazing across the running course today with impressive speed. Nearly all improved on their times in spite of a hillier and grassier course. We returned to Headfort and the next few hours were spent swapping team gear and accessories until each of us ended up with at least one thing from every country represented on the exchange. Then, we had a very nice formal dinner and then enjoyed some music and dancing late into the night. Tuesday morning was full of jokes and memories but some hard goodbyes. While it was hard to say goodbye to the amazing friends we made during the 2016 International Tetrathlon Exchange, we know that they are lifelong friends and that we’ll always have a home in Australia, New Zealand, Ireland, and the UK. We look forward to hopefully reuniting at the next Tetrathlon exchange hosted by the US in 2018!